Solution: Teach a Two-Year-Old to Swim? Is a two-year-old too young to learn to swim? My daughter would love to know how and of course I’d feel better if she knew how to swim, but where we live they don’t have lessons for kids that young. Should I try to teach her myself? I’m not sure I could. Although children usually don’t swim independently till about age four, it’s certainly possible for much younger children to learn. The American Red Cross offers lessons to children six months to three years old, always involving a parent. In the upper level of these lessons, the kids begin to swim. 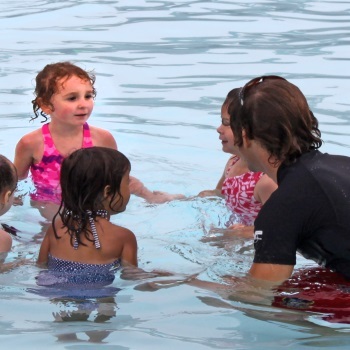 Other programs for very young children emphasize learning to float in case of accidentally falling into water, and the Infant Swim Resource program teaches a “float-swim-float” sequence. If you can’ t find an age-appropriate program and are unsure about teaching your child yourself, you may want to look into resources such as videos that can help you with this. Whatever water-based lessons your daughter ends up learning at this age, at home or anywhere else, you’ll be heavily involved anyway. The information on this site is not intended to replace personal consultation. Please consult a professional in matters involving your child’s health and safety. The author and publishers will not be held liable. Comments on Solution: Teach a Two-Year-Old to Swim?